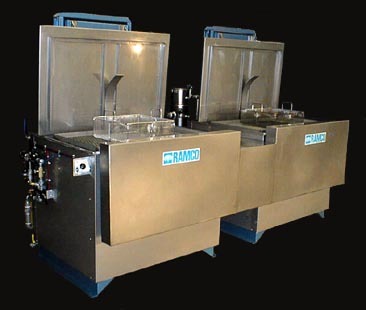 This solvent washing system was built for a large mass transit overhaul facility. 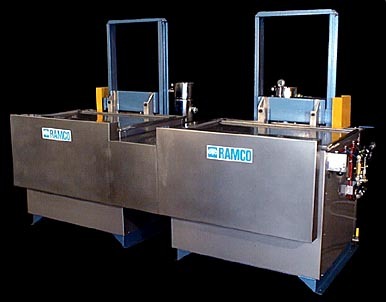 It is designed for washing critical drive components in a low flashpoint solvent. The components to be cleaned are batch loaded into baskets and placed onto a transport elevator. 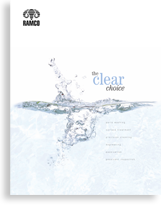 A three position pneumatic valve is used to control the process – up, down (soak) or agitate. As the elevator(s) descend into solution the cover(s) close automatically. The tanks and exterior panels are constructed of stainless steel . The system is all pneumatically driven. 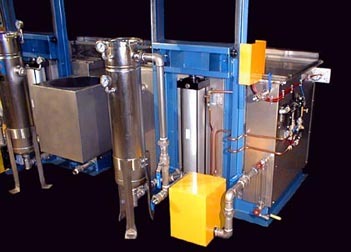 An air diaphragm pump is used to operate the large filtration unit (see below). A lip vent exhaust system is attached to the washing tanks and ducted to a remote blower. The entire system is explosion proof and safety interlocked to prevent operation if the exhaust system is not functioning. The large slotted stainless steel lip vent and plenum (above left) extends across the front of the processing chamber(s) and terminates in the center for connection to a large extraction blower. The ventilation is designed for 200 cfm per square foot of opening. Positive mechanical ventilation limits the accumulation and/or spreading of chemical vapors from the surface of the solution to the surrounding area thereby making the system safer and lessening any potential hazard to the immediate environment.